Someone with so many conflicts of interest cannot be entrusted with one fifth of all land in the United States. WORC Board Chair Linda Weiss sent a letter to the US Senate Energy and Natural Resources Committee opposing the confirmation of David Bernhardt as Director of the Department of the Interior. Below is the text of the letter. I write in opposition to the confirmation of David Bernhardt as Secretary of the Department of the Interior in my capacity as Chair of as well as on behalf of the Western Organization of Resource Councils (WORC). WORC is a regional network of eight grassroots community organizations with 15,190 members and 39 local chapters and affiliates in seven states, including Colorado, Idaho, Montana, North Dakota, Oregon, South Dakota, and Wyoming. WORC’s mission is to advance the vision of a democratic, sustainable, and just society through community action. WORC is committed to building sustainable environmental and economic communities that balance economic growth with the health of people and stewardship of their land, water, and air resources. WORC helps its member groups succeed by providing training and coordinating issue work. It is clear that David Bernhardt has not and cannot fulfill the Secretary of the Interior’s mandate to both protect and manage our public lands and waters. The Department of the Interior manages one out of every five acres of land located within the United States. Much of that land is located out West, where WORC’s members live, work, farm, and ranch. The public lands and minerals management decisions made by the Secretary of the Interior have major implications for the health and wellbeing of our members, as well as all other Americans who rely on clean air, drinkable water, and healthy agricultural systems. 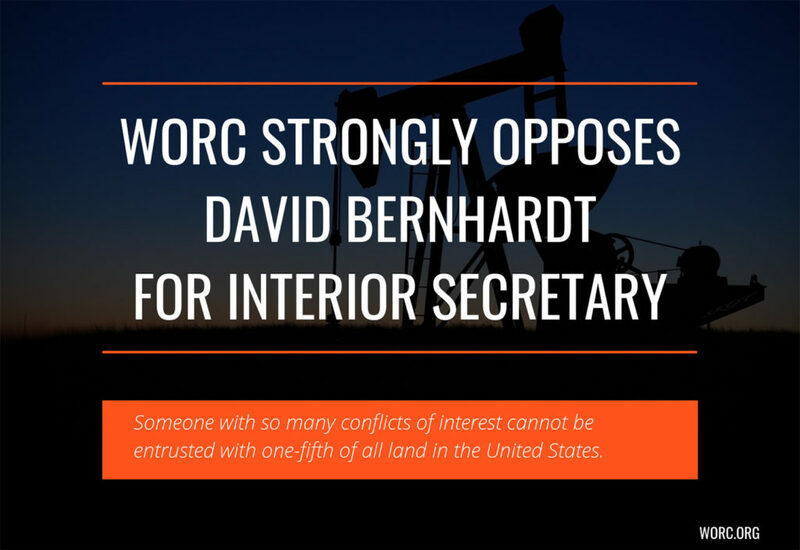 For this reason, WORC cannot support the nomination of David Bernhardt as the Secretary of the Interior. In fact, we strongly oppose his nomination, and find serious fault with his current tenure as acting secretary. Over Bernhardt’s eighteen months as Deputy Secretary, Interior pursued multiple regulatory rollbacks, initiated proceedings to cut the public out of decision making processes by streamlining the review and permitting system under the National Environmental Policy Act (NEPA), and launched an energy dominance agenda that elevated fossil fuel development over other uses of public lands. The Department of the Interior manages one out of every five acres of land located within the United States. Decisions made by the Secretary of the Interior have major implications for the health and wellbeing of our members, as well as all other Americans who rely on clean air, drinkable water, and healthy agricultural systems. During the recent government shutdown, the Bureau of Land Management continued to process oil and gas drilling permits, while Interior simultaneously did not accept public comments on proposed rulemakings, failed to notice leases sales in Colorado and New Mexico, and left national parks and monuments unstaffed and unprotected, among other management decisions. The fact that processing drilling permits was considered essential during the shutdown makes it evident that Bernhardt’s Interior prioritizes energy development above other uses and management duties. Bernhardt has had as many as twenty-six special interest conflicts before Interior – notably so numerous that he must carry a card that lists them – and pledged to recuse himself from working on issues involving these twenty-six conflicts for a period of at least one year; two years for more than twenty of the conflicts. These conflicts concern parties ranging from oil and gas corporations and casinos to lobbying firms and water districts, some of whom appear to have benefited from special consideration while Bernhardt has been at Interior. Over Bernhardt’s eighteen months as Deputy Secretary, Interior pursued multiple regulatory rollbacks, initiated proceedings to cut the public out of decision making processes by streamlining the review and permitting system under the National Environmental Policy Act (NEPA), and launched an energy dominance agenda that elevated fossil fuel development over other uses of public lands. A recent Politico article describes the contents of a recorded Independent Petroleum Association of America event in June 2017, five months into the Trump administration. Oil and gas executives were quoted as calling their access to Bernhardt “unprecedented,” “direct,” and one even emphasized that conversations with Bernhardt “…about issues ranging from federal land access to endangered species” were taking place. The New York Times has also published a piece showing that Bernhardt has likely violated his own ethics pledge. Less than one-year after being appointed as deputy secretary, he began weakening protections for the delta smelt, a move that would benefit his previous client, Westlands Water District, by freeing up river water for agriculture. The Secretary of the Interior has the privilege and responsibility of guiding responsible energy development on our nation’s public lands, considering and minimizing impacts to water, air, soil, protected places, wildlife, and people. It is clear that David Bernhardt has not and cannot fulfill the Secretary of the Interior’s mandate to both protect and manage our public lands and waters. In conclusion, we reiterate our strong opposition to his nomination, and ask you to consider voting against his confirmation.